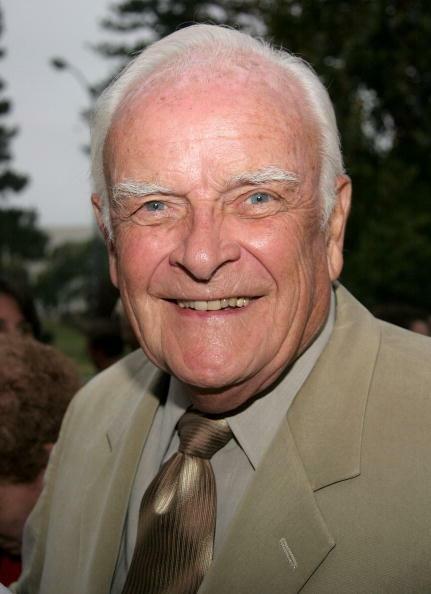 John Ingle, best known for the role of patriarch Edward Quartermaine on ABC’s “General Hospital,” died surrounded by his family in California on Sunday, September 16 after a courageous battle with cancer. His beloved wife of 57 years, Grace-Lynne Martin, passed away earlier this year on February 11, 2012 of natural causes. Ingle is survived by their five daughters, Jessica, Jenny, Carey, Melanie and Chrissy, and nine grandchildren. Ingle last taped “General Hospital” this year, on August 24, and his final appearance aired September 11, fulfilling a wish to play Edward one last time. And with a simple “I love you, too,” a thumbs up and a smile, we say goodbye to John Ingle’s indelible depiction of Edward Quartermaine. His bigger than life portrayal will live on in the hearts of countless fans. While Ingle described Edward Quartermaine as someone who “likes to think that he’s taught everyone around him how to be ruthless,” Ingle himself was a great nurturer. He used his talents to encourage, and was regarded as a beloved and respected teacher, having founded the performing arts departments at both Hollywood and Beverly Hills High Schools in 1955 and 1964, respectively. For three decades he taught drama before he began his successful career as an actor. Among his stellar students were Albert Brooks, Nicolas Cage, Richard Dreyfuss, Joanna Gleason, Barbara Hershey, Swoosie Kurtz, Stefanie Powers, David Schwimmer and Jonathan Silverman. Ingle retired from teaching in 1985 and began an acting career the same year. He joined “General Hospital” in 1993. Born in Tulsa, Oklahoma on May 7, 1928, Ingle’s family moved throughout the Midwest before settling in Tujunga, California, where he finished high school. His thespian pursuits had begun years before, in elementary school, and followed him until he attended OccidentalCollege to study theater and journalism. He received his theater degree in 1950 and got his teaching credentials the next year. In 1951 Ingle met Grace-Lynne Martin, an accomplished singer/actress. The couple married in 1954. The next year he began teaching at Hollywood High during the day and at Los Angeles City College at night. He also taught afternoon classes at UCLA for 15 years. After nine years at Hollywood High, he moved across town, where he eventually spent 21 years teaching at Beverly Hills High.